Mon 15:00 They say that variety is the spice of life, but try telling that to Mark Webber, Sebastian Vettel and the Red Bull Racing team. Six poles out of six and three victories from the last four races has left the rest of the grid chasing the championship leaders. The future looks bright for the Milton Keynes-based outfit. 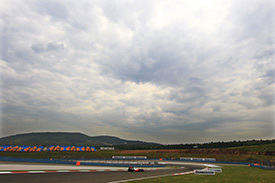 Webber's mood is likely to be matched by the weather this weekend at Istanbul Park - scene of round seven in the 2010 FIA Formula 1 World Championship, as the second fully-dry weekend in a row beckons. Low pressure covering much of eastern Europe is delivering cool conditions to Greece and Turkey, but over the coming days much more stable weather and a warmer airmass will arrive from the west, leading us into a dry and warm early portion of the weekend. A weakening area of low pressure may move south-east towards Turkey on Saturday and Sunday - heralding slightly fresher conditions for qualifying and the race. Practice day on Friday is set fair with some patchy cloud but a good deal of sunshine for both sessions. The rising temperatures will reflect the fine weather, peaking at 27 degrees Celsius. Current forecasts suggest that the predicted advancement of low pressure from central Europe may fall short of the Turkish border, but it is certainly a feature to watch over the coming days. Our view is that the settled weather will hold, resulting in a dry and warm Saturday and Sunday, with temperatures down slightly on the Friday mark, at 25 degrees. The early trend points towards a dry weekend with little chance of rainfall affecting the track action. As the teams gather on Thursday to send their cars for scrutineering, we will be taking another look at the latest weather prospects for the race weekend. Thu 15:45 Forecasts of a dry and mainly sunny weekend with no rain became ever more certain today as the drivers arrived to check out the Istanbul Park circuit and preparations wrapped up in the pits ahead of tomorrow's practice sessions. Earlier this week, forecasts pointed towards a lurking area of low pressure that could make the air over northern Turkey less stable - particularly on Saturday and Sunday. But, over recent days, the predictions for fine weather throughout have improved considerably as higher pressure from Libya and Egypt remains in control, keeping the unsettled picture in central Europe at bay. With no rain expected across the three days, we start tomorrow's practice day with clear skies, plenty of sunshine and just a light breeze. Temperatures have been on the rise at Istanbul this week and should peak at around 30 degrees Celsius. There is set to be little change on Saturday for final practice and qualifying as the pleasant weather continues. Scattered clouds may drift in from time to time, but conditions at the circuit will remain very bright with a top temperature matching Friday's mark at 30 Celsius. Race day will roll over Saturday's theme of lengthy sunny spells and a few scattered clouds dotted around the skyline. It will be warm once again, but with the maximum air temperatures down just a little at 28 degrees, however it will still be tough work for the drivers with track temperatures expected to climb way over 40 degrees on each day. 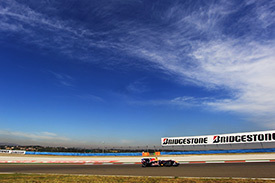 Will the dominant Red Bull team stamp its authority on another Formula 1 weekend here in Turkey? Join us on AUTOSPORT Live for all the blow-by-blow practice action tomorrow from 06:45 GMT. Fri 14:46 Glorious weather conditions and some searing action on the circuit provided a good start to another Formula 1 weekend, as Istanbul Park delivered 30 degree heat and track temperatures above 50 Celsius. Clearly Bridgestone is on the right lines with its hardest tyre allocation, given the history of punishing events here on the softer tyres and the warm temperatures seen so far this weekend. That trend is set to continue over the next couple of days, as an area of high pressure towards north Africa extends as far north as Turkey, keeping the cooler, more unstable weather over central Europe at bay. Dry, warm and predominantly sunny weather will continue on Saturday and through to race day, albeit with a few more clouds around than we saw today. Tomorrow morning will dawn dry but reasonably cloudy. However, sunny spells will quickly develop through the morning with mainly sunny conditions for qualifying. The temperature will drop ever-so-slightly by a degree or so to 29 Celsius, with track temperatures also down a touch in the high forties range. On Sunday we will see a repeat performance with some cloud around early in the morning. During the support races more breaks are set to develop, providing lengthy sunny periods for the race. Temperatures could drop a further click or two to 28 degrees, but overall it will still feel very warm in the sunshine. With stable weather for the coming days, the main question switches back to the track action, as we all wonder if the rapid Red Bulls will be as reliable as the forecast. Join us tomorrow from 07:45 GMT for the Saturday morning practice session from Istanbul Park as the teams work towards qualifying. Sat 14:24 The skies above Istanbul Park may have been dull and grey at times during Saturday, but the action down on the track during final practice and qualifying by contrast was sensational at times. The only slice of drama missing was right at the end of the top ten shootout, but nonetheless Mark Webber maintained Red Bull's 100 percent strike rate in qualifying this year. Friday was stunningly hot and featured wall-to-wall sunshine, but today it certainly felt a lot cooler as the layer of cloud struggled to shift away. Tomorrow we can expect a half-way house between the two. Yes, there will be some patches of cloud around - enough to mask the sun at times - but generally we will see some good sunny periods and rising temperatures once again. A maximum air temperature of 28 degrees is anticipated but warmer track temperatures - possibly up to 49 degrees - thanks to the increased level of sun shining down on on the circuit. Will Mark Webber claim a hat-trick of wins and show signs of running away with the championship? Join us for full coverage of race day at Istanbul Park, tomorrow from 10:30 GMT.